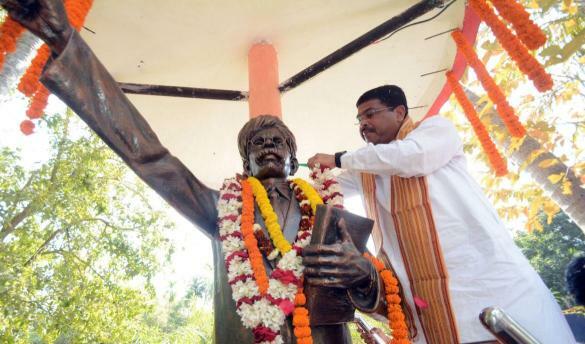 ONI Bureau: Union Minister for Petroleum and Natural Gas Dharmendra Pradhan on Sunday paid rich tribute to Utkal Gourav Madhusudan Das on his 84th death anniversary at his workplace ‘Madhusmruti’ in Satyabhamapur village under Salepur block in Cuttack. Social activists, litterateurs politicians, and eminent people from various walks of life paid floral tributes to Madhu Babu on his death anniversary. The first graduate and advocate of Odisha, Madhu Babu was one of the most modern thinker, lawyer, political reformer, litterateur and social worker. He wrote many poems in both english and odia language. “Utkal Santan” & “Jati Itihash” are some of his important poems.